Climate change was the dominant theme at and this year's World Economic Forum (WEF). Panel discussions covered a wide range of related topics and including global warming, ocean sustainability and biodiversity. Al Gore, David Attenborough and Jane Goodall were among the participants. 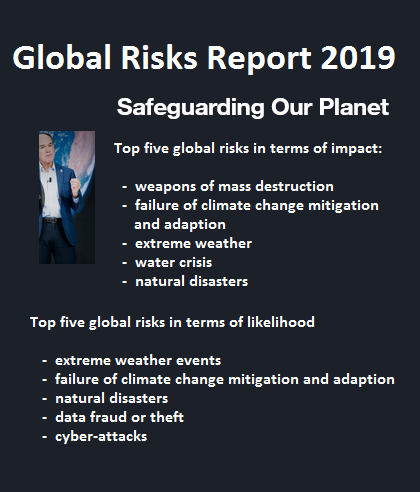 This year's Global Risk Assessment report released at the WEF in Davos revealed, yet again, that climate change and related phenomenon are among the greatest risks both in terms of impact and likelihood. The report surveys nearly 1,000 decision-makers (public sector, private sector, academia and civil society) who are asked to assess the risks facing the world. Over a ten-year horizon, extreme weather and climate-change policy failures are seen as the gravest threats. The WEF has issued many similar warnings in recent years. The 2016 Global Risks Report was the first that put environmental risks at the top the ranking. This report said the failure of climate change mitigation and adaptation is the risk with the greatest potential to impact society. It specifically warned about the impact of climate change on food security. As an interesting aside, the 2016 report included a prophetic warning about the risks associated with disempowered citizens. The experts at Davos called for corporate and government action and there was widespread agreement that this requires economic change. As reported by CNN, these experts singled out fossil fuel subsidies in G7 countries. "There are still fossil fuel subsidies from G7 countries — that's ridiculous," said Rachel Kyte, special representative of the UN Secretary-General for Sustainable Energy. "Why we are subsidizing something we know is killing our children, poisoning them and affecting their ability to learn? That's beyond me," she added. Attenborough, Gore and others have been sounding the alarm about climate change for years. However, the most powerful warning came from 16 year old Greta Thunberg who told attendees: "I don't want you to be hopeful, I want you to panic, I want you to feel the fear I feel every day," She also pulled no punches when she ascribed blame those assembled in Davos: "Some people say that the climate crisis is something that we will have created, but that is not true, because if everyone is guilty then no one is to blame. And someone is to blame," Thunberg said flatly. "Some people, some companies, some decision-makers in particular, have known exactly what priceless values they have been sacrificing to continue making unimaginable amounts of money. And I think many of you here today belong to that group of people." After her speeches at COP24 and the WEF Greta has emerged as a leading voice for climate action. She is a realist in a world where many are either ebulliently optimistic about the prospects for climate action. "Many people say that this is not an easy issue, we cannot just say that this is how it is, it's not black and white. But I say that this is black and white. Either we stop the emissions or we don't. There are no gray areas when it comes to survival,"Greta said. 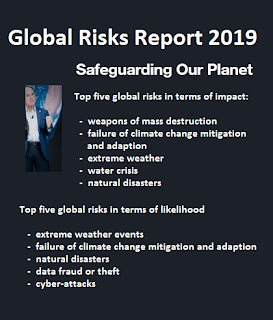 In a chapter on the human causes and effects, the Global Risks Report 2019 calls for greater action around rising levels of psychological strain across the world. "The world faced a growing number of complex and interconnected challenges in 2018. From climate change and slowing global growth to economic inequality, we will struggle if we do not work together in the face of these simultaneous challenges," the report's authors conclude.